Hello! I'm popping in to share a card I created for my son's Middle School Coach! The school year is wrapping up and the sports season is wrapping up as well. My son is on three baseball teams this season. Middle School ball, Travel ball, and Little League. He has two coaches for Middle School, so I will be sharing another card make in the next day or so. My crafting time is so limited these days, so I always have a plan in my head to "just do simple", but then I start pulling out all my supplies and it keeps layering and layering. Ha! I started this card by making an A2 base from gray cardstock. I don't have a lot of masculine papers in my collection, so I always reach for this velour strip paper I have had for years. I actually used it to make my son's thank you notes from his 6th birthday and he is now 12 1/2. (Not sure how that happened, but I blinked is all) It has made the perfect paper to use in many of the baseball cards I've made over the years. The school colors are Navy and Gray. I'm sure I will be using it in the card for the other coach, so don't be surprised if you see it again. I adhered the patterned paper to the card base. I used some layered mat stack die cuts from PTI to hold my focal image. I stamped a baseball and thought it would be cute to make it into a ribbon. I had a scrap of Navy ribbon, so I attached to a piece of gray cardstock and embellished with white enamel dots. I stamped the sentiment and tucked it up under the ribbon panel. One down and another to go. I am joining in at: A Gem of a Challenge - It's a Man's World, Hiding in my Craft Room - Masculine/Father's Day. CardzTV - Anything Goes, Brown Sugar Challenge Blog - Masculine or Father's Day, D.L. Art - May Linky, International Art and Soul - All About Boys or Men, 613 Avenue Create - Anything Goes with a Twist mainly blue, Jo's Scrap Shack - Anything Goes. I thought I would share some pictures of my son and one I captured of them standing on the fence cheering and chanting during their at bat. Anybody who has followed me long enough or follows me on facebook knows I refer to my son as the short stack. This picture says it all. He is the little guy among all those big guys. This team is 6-8 graders, but to his left #22 is in 6th. He is actually on the tall side for his age where mine is the opposite end of the height spectrum. Thank you for stopping in! Have a terrific Thursday! Loveeeeeee that card!!! SO FUN!!! And loving the photos of your son and the other kids!!!!! it's that time of the year ... thank yous to all the coaches and teachers out there ... I love this one for the baseball coach ... well done !! Thanks for entering in the Brown Sugar Challenge. Best of luck to you. 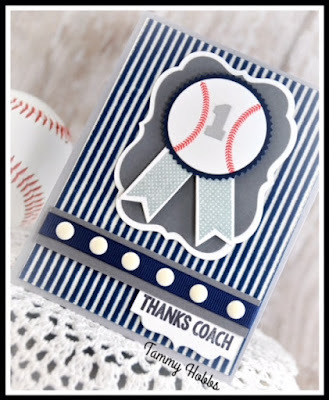 Awesome baseball card for the coach, Tammy! Fab design and wonderful baseball with the number one on it! The coach will love it! Great baseball photos with your son, too! I remember the baseball days with my son...fun times!! Love the baseball as a central "medallion" and the stripes just say, "Take me out to the ball park." I miss the little league days. Enjoy every one, and keep sharing at Jo's Scrap Shack. Great design - very striking. Awww, love these pictures of your short stack! That photo of the line-up is absolutely priceless! And what a fabulous card! Love that baseball, and love how you did the sentiment here. The row of enamel dots looks amazing, too! Fantastic card! totally love the card design! 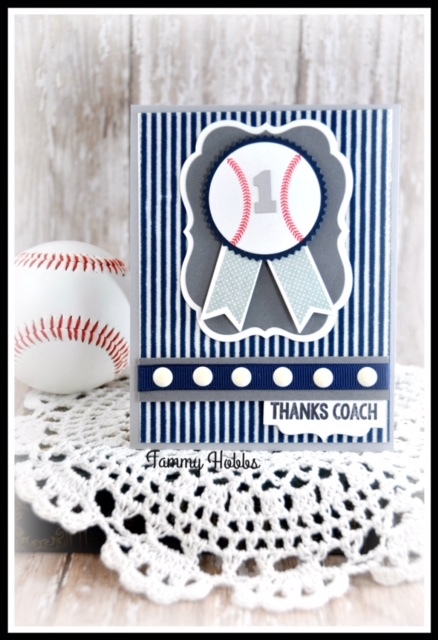 Your son's coach should feel special to receive such a thoughtful card - well done! Thank you for playing along at Brown Sugar Challenge.